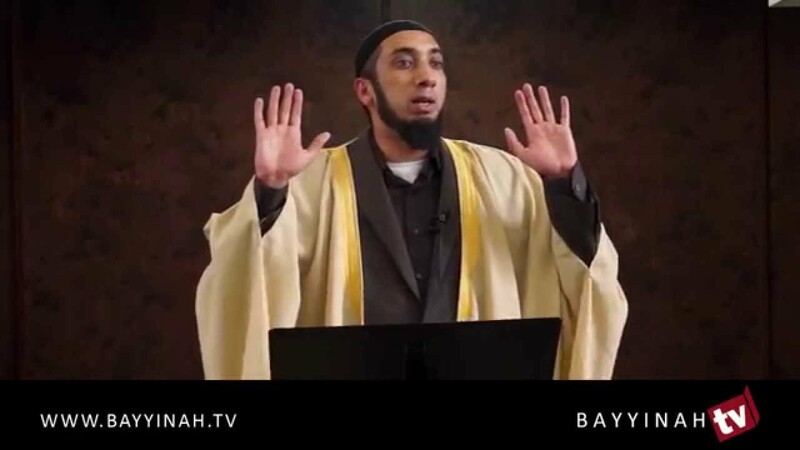 Nouman is the founder and CEO of Bayyinah, as well as the lead instructor for a number of Bayyinah courses including the ‘Fundamentals of Classical Arabic’ and ‘Divine Speech’. 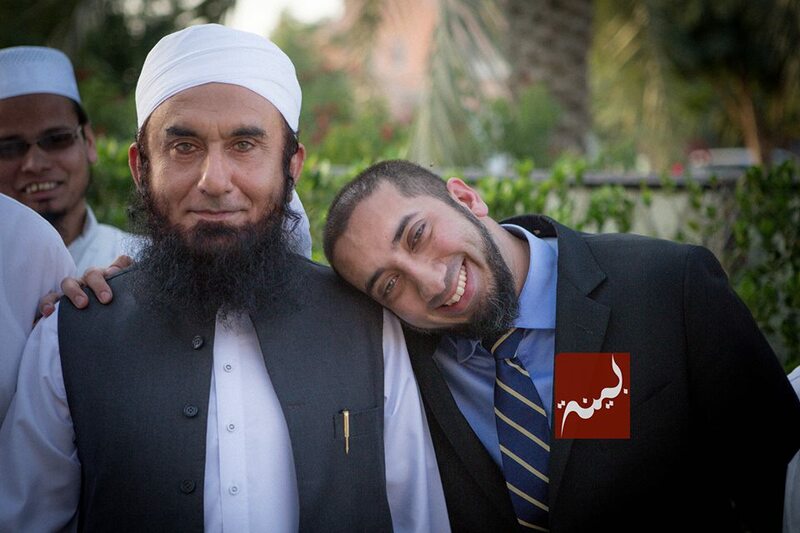 His first exposure to Arabic study was in Riyadh, Saudi Arabia where he completed his elementary education. 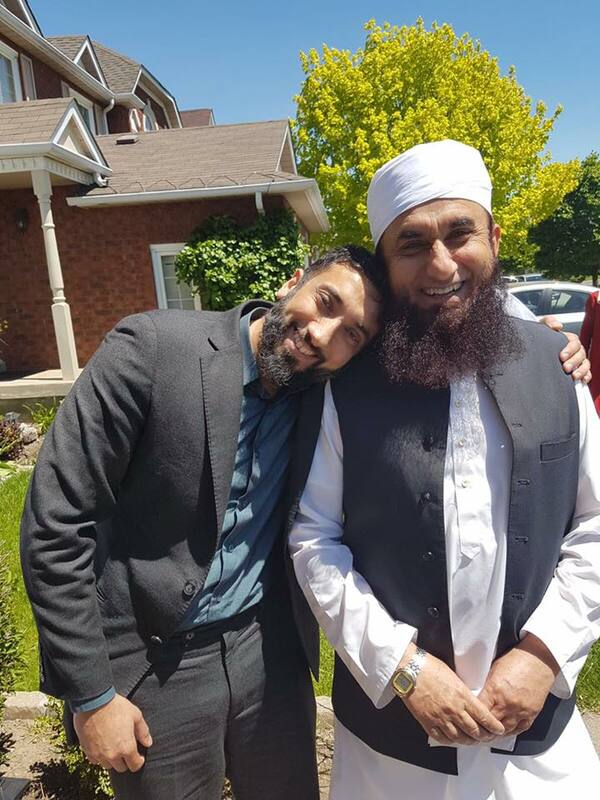 He continued Arabic grammar study in Pakistan, where he received a scholarship for ranking among the top 10 scores in the national Arabic studies board examinations in 1993. But his serious training in Arabic began in the United States in 1999 under Dr. Abdus-Samie, founder and formal principal of Quran College, Faisalabad, Pakistan who happened to be touring the US for intensive lectures in Tafsir and Arabic studies. 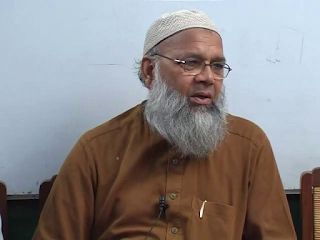 Under Dr. Abdus-Samie, Nouman developed a keen methodical understanding of Arabic grammar. He further benefited from Dr. Abdus-Samie by internalizing his unique teaching methods and later translating his work into English for the benefit of his own students. 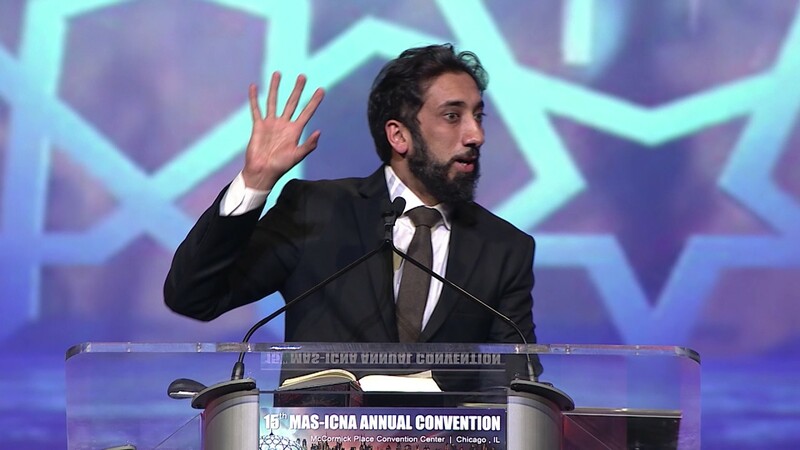 Nouman served as professor of Arabic at Nassau Community College until ’06 and has taught Modern Standard and Classical Arabic at various venues for nearly 7 years with over 10,000 students nationwide. 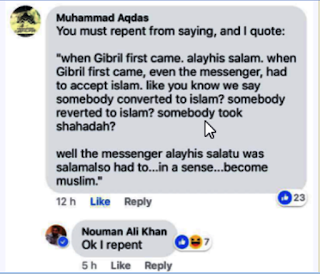 He claims that until Gibril alayhi's salam came to RasulAllah sallAllahu alayhi wa sallam with wahy, he was not a Muslim and he BECAME a Muslim first. see..if you are talking to someone...if i talk to you...if you are, for example a professor, I say: 'you are sitting here'. I don't say: 'the professor is sitting here'. because if i am talking to you, i use the second person; i don't use the third person. But Allah is talking to the Messenger alayhi's salatu wa's salam. what does He say: 'Aaman al-Rasul'...laa, lam yaqul (no, He did not say)...aamanta. yukhatibuhu mubasharatan, a laysa kadhalik...(He is addressing him, is it not so?). he is talking to him directly. He didn't say: 'you believed', he said: 'the messenger believed'. SallAllahu alayhi wa sallam. wa hadha takriman li'n nabiyy alayhi's salatu wa's salam. even in his presence He speaks in the third person to honour him. 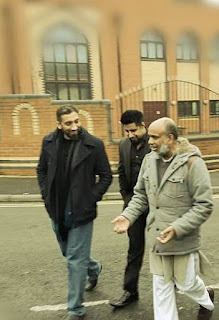 alayhi's salatu wa's salam. and Allah is letting him know, that when Gibril first came. alayhis salam. when Gibril first came, even the messenger, had to accept islam. 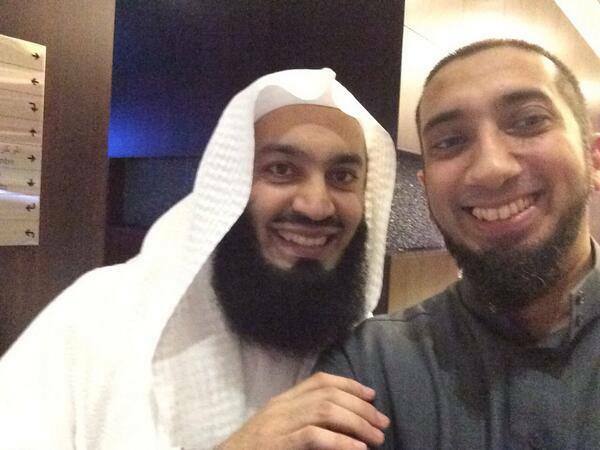 like you know we say somebody converted to islam? well the messenger alayhis salatu was salam also had to...in a sense...become muslim. when the angel came. and that moment was a big moment. when the angel came he has no idea what is going on. he has no clue, what this is yet. 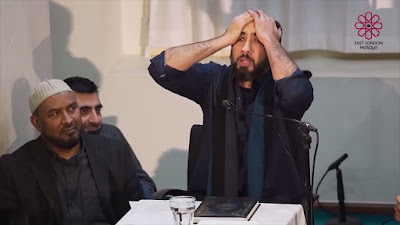 when he is being shaken and when he is told iqra'a 'read, read' he has no idea (nouman snickers here) what is going on. This is sarih kufr. because nouman is clearly saying that RasulAllah sallAllahu alayhi wa sallam was not muslim before this. al-iyadhu billah. and if you would have any doubt, notice that he clarifies in THREE clauses: that it was the same as: CONVERTED, REVERTED, TOOK SHAHADAH. that is when a kafir becomes a muslim. 1. he should categorically repent from disrespectful statement to RasulAllah sallAllahu alayhi wa sallam in that video. 3. edit the video and remove the offensive segment and publicly put out a statement to not share that segment/ video that contains that segment. we will keep our word of withdrawing our protest. in sha'Allah. 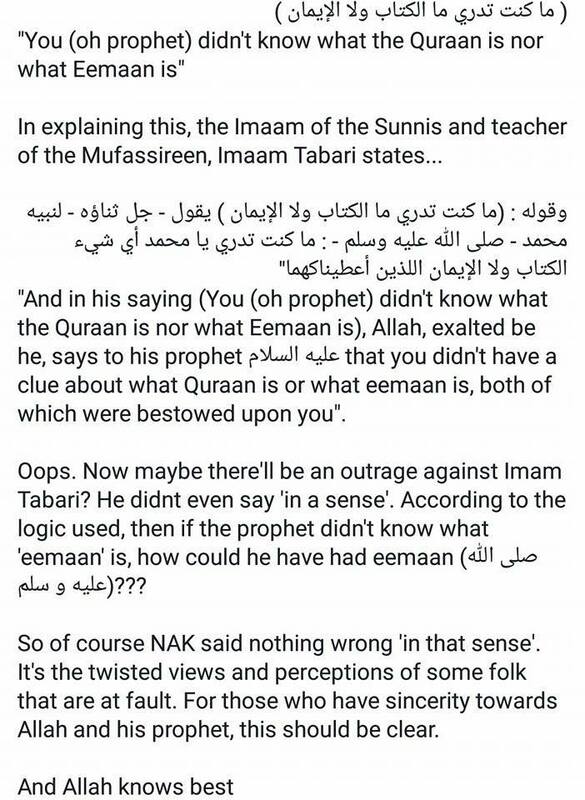 ^ some deobandi apologist for nouman apparently used tafsir tabari to explain nouman's blasphemy and hinged on the 'in a sense' that nouman inserted. smarty, what about the "converted, reverted, took shahadah" comparison? and thereafter the rest of the derisive piece - he calls 'tafseer'. shame on scoundrels who have no adab when talking about RasulAllah sallAllahu alayhi wa sallam. الأوَّلُ: ﴿ما كُنْتَ تَدْرِي ما الكِتابُ﴾ أيِ القُرْآنُ (ولا الإيمانُ) أيِ الصَّلاةُ، لِقَوْلِهِ تَعالى: ﴿وما كانَ اللَّهُ لِيُضِيعَ إيمانَكُمْ﴾ [البَقَرَةِ: ١٤٣ ] أيْ صَلاتَكم. 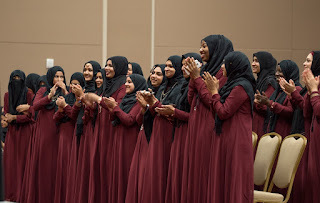 الثّانِي: أنْ يُحْمَلَ هَذا عَلى حَذْفِ المُضافِ، أيْ ﴿ما كُنْتَ تَدْرِي ما الكِتابُ﴾ ومَن أهْلُ الإيمانِ، يَعْنِي مَنِ الَّذِي يُؤْمِنُ، ومَنِ الَّذِي لا يُؤْمِنُ. الثّالِثُ: ﴿ما كُنْتَ تَدْرِي ما الكِتابُ ولا الإيمانُ﴾ حِينَ كُنْتَ طِفْلًا في المَهْدِ. الرّابِعُ: (الإيمانُ) عِبارَةٌ عَنِ الإقْرارِ بِجَمِيعِ ما كَلَّفَ اللَّهُ تَعالى بِهِ، وإنَّهُ [ﷺ] قَبْلَ النُّبُوَّةِ ما كانَ عارِفًا بِجَمِيعِ تَكالِيفِ اللَّهِ تَعالى، بَلْ إنَّهُ كانَ عارِفًا بِاللَّهِ تَعالى، وذَلِكَ لا يُنافِي ما ذَكَرْناهُ. مِنها ما يُمْكِنُ مَعْرِفَتُهُ بِمَحْضِ دَلائِلِ العَقْلِ، ومِنها ما لا يُمْكِنُ مَعْرِفَتُهُ إلّا بِالدَّلائِلِ السَّمْعِيَّةِ. فَهَذا القِسْمُ الثّانِي لَمْ تَكُنْ مَعْرِفَتُهُ حاصِلَةً قَبْلَ النُّبُوَّةِ. 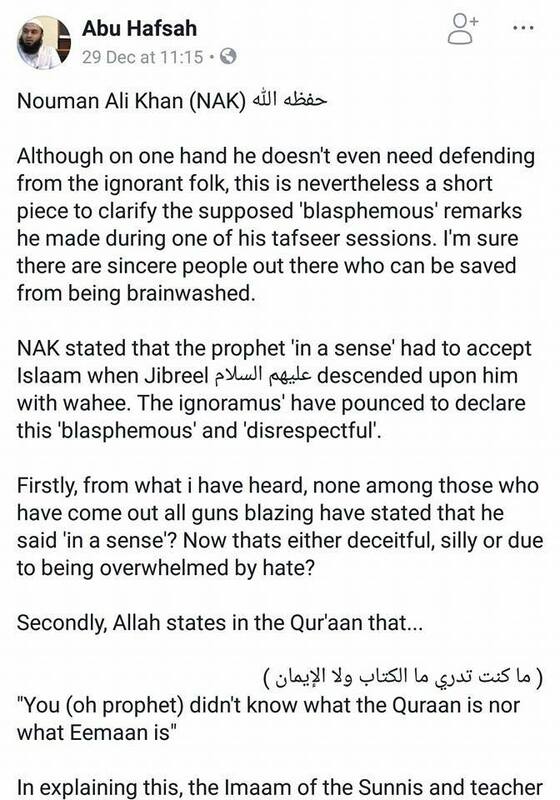 Here, Imam ul-Mufassireen, the genius exegetist, Imam Fakhruddin al-Razi in his monumental Tafsir, Mafateeh ul-Ghayb (aka al-Tafsir ul-Kabir) categorically destroys the Wahhabiyyah/Deobandi argument. 5. The attributed of Allah are of two types; those which can be recognized just through logical evidences, and those which can only be known through revelatory evidences. The negation of Imaan in this verse is only of those attributes that fall into this second category, i.e. the recognition of those attributes was not attained before revelation. 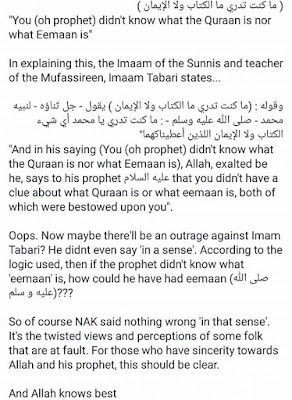 Now having understood this, especially the Ijmaa (consensus) upon what cannot possibly be intended by this verse, let’s study Imam Tabari’s commentary. وقوله : (ما كنت تدري ما الكتاب ولا الإيمان ) يقول - جل ثناؤه - لنبيه محمد - صلى الله عليه وسلم - : ما كنت تدري يا محمد أي شيء الكتاب ولا الإيمان اللذين أعطيناكهما"
Here Imam al-Tabari is not saying that the Prophet ﷺ didn’t have Imaan before revelation; rather he is saying that this verse negates that specific Imaan that came with the revelation of the book (hence why these two things – the Book and Imaan – have been coupled together, with the Imam referring to them both with a dual Ism Mausool and a dual Dameer) – i.e. you did not know the Book, and you did know the Imaan that came with the Book. The Imaan in the Existence and Oneness of Allah is not being negated here, as that was always possessed by the Prophet (s), but rather this verse is referring to the finer details of Imaan, such as the details of prayer, fasting, charity, etc. Thus concludes the exposition of the Wahhabiyyah/Deobandi deceit and misquoting of Imam al-Tabari. 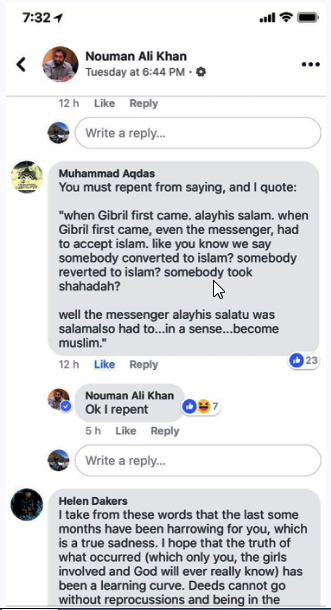 Our challenge to these ignoramuses, whose ignorance is such that they don’t even know the plural of ignoramus, is to bring any evidence from any classical Sunni scholar in history who said ‘The Prophet ﷺ had to convert to Islam’, with or without the clause ‘in a sense’ ? 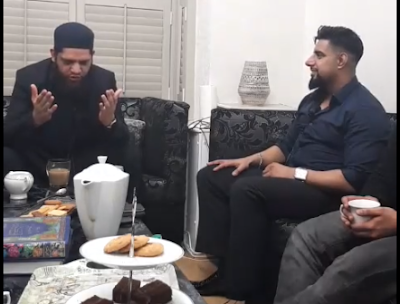 On Saturday 3rd March 2018 via live stream (above) in front of thousands, nationally and internationally, a certain individual agreed to a debate with Shaykh Asrar, agreed to a cordial debate, agreed to debate conditions, and put on a wonderful act of love and hugs thus sealing the deal so to speak. Unfortunately, the truth followed soon thereafter. Shaykh Asrar contacted him directly early afternoon on Monday 5th March in regards to the debate, however, he did not answer or reply. Instead 9 hours later he goes online via his own Fb live stream and makes a statement in front of his 300 viewers refusing to debate, with excuses that were good enough for him and his followers to convince themselves they are in the right. Now although there was no contract, and the individual was not blood bound to debating Shaykh Asrar it does show the character of the individual. 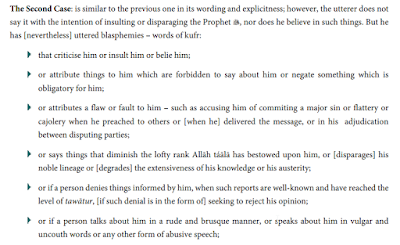 Someone who cannot keep their word, someone who cannot abide by principles of a mufti or scholar. If you are posing as a mufti/scholar then you need to live up to these titles or else denounce them, because otherwise this is misleading the innocent unsuspecting naive public, both Muslim and non-muslim. He is someone who cannot follow through on issues pertaining to our religion which are crucial to the faith of many, which can affect the Imaan of many. The individual has lost all credibility. 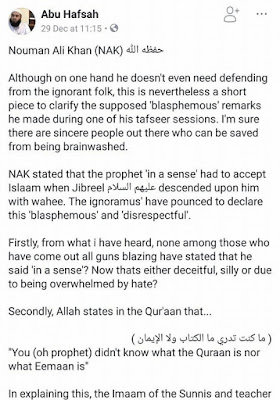 Indeed he has fallen short, leaving his character in question by not just the Ahlus Sunnah, but the Salaf, the Shia and many others who have messaged us since. 1) Hadith on the authority of Abu Hurayra: I heard the Prophet say: "By the one in Whose hand is Abu al-Qasim's soul, `Isa ibn Maryam shall descend as a just and wise ruler. He shall destroy the cross, slay the swine, eradicate discord and grudges, and money shall be offered to him but he will not accept it. Then he shall stand at my grave side and say: Ya Muhammad! and I will answer him." Ibn Hajar al-`Asqalani cites it in al-Matalib al-`aliya (Kuwait, 1393/1973) 4:23, chapter entitled: "Concerning the Prophet's life in his grave" and #4574. Haythami says in Majma` al-zawa'id (8:5), Chapter entitled: "`Isa ibn Maryam's Descent": "Its sub-narrators are the men of sound (sahih) hadith." 2) Is there a sahi hadith in Musnad of Imam Hanbal( rh) or any other book which says that Isa Bin Maryam ( alaihis salaam) will be buried next to the grave of prophet Mohammed ( sal lallahu allaihi wa sallam)? If yes , then will Isa Bin Maryam ( alaihis salaam) die near the grave of prophet? 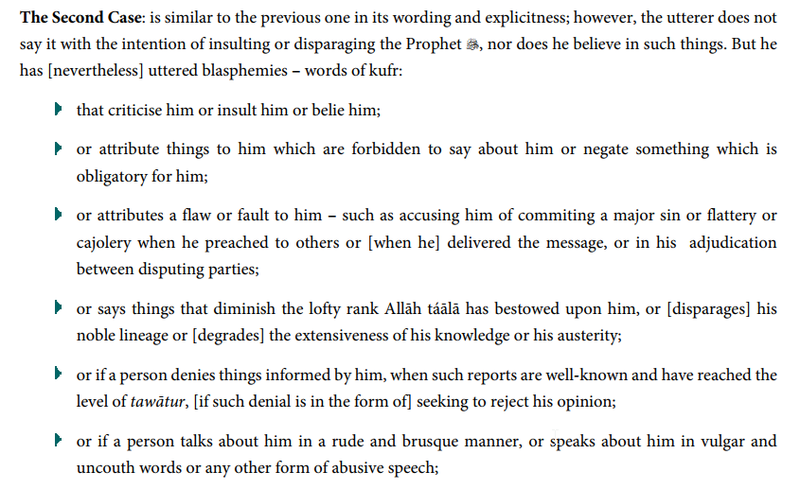 Or the hadith in (2) mentions only to those prophet who come with book? I would be really thankful to you if you can please provide the clarification on the above issues. 1. Yes, the above hadith has been confirmed and mentioned in Mustadrak lil Hakim as well. 2. This hadith had been mentioned in Mirqaatul Mafateeh on pg 67, volume 11, Maktaba Imdaadiyah print. Similarly, the hadith concerning a prophet being buried at place of his death is mentioned in Shamaail Muhammadiyyah, pg 665, hadith 396. 3. Hazrat Eesaa (AS)’s reappearance in this world will not be as a Nabi but rather as an Ummati of Rasulullah (صلى الله عليه و سلّم). Who Explained Sahih al-Bukhari ? ما حكم التعامل مع المخالف لعقيدة السلف الصالح كالأشاعرة والماتريدية ومن نحا نحوهم والتعاون معهم على البر والتقوى والأمور العامة وهل يحرم العمل معهم سواء كانت الإدارة لنا وهم يعملون تحتنا أو العمل تحت إشرافهم؟ وهل هم من الفرق الضالة الاثنتين والسبعين؟ وهل التعامل معهم يعد من باب تولي غير المؤمنين؟. فجواباً على ذلك نقول: الأشاعرة والماتريدية قد خالفوا الصواب حين أولوا بعض صفات الله سبحانه. 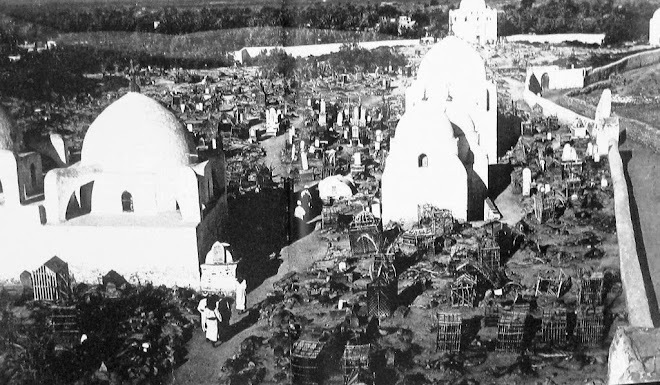 لكنهم من أهل السنة والجماعة، وليسوا من الفرق الضالة الاثنتين والسبعين إلا من غلا منهم في التعطيل، ووافق الجهمية فحكمه حكم الجهمية. أما سائر الأشاعرة والماتريدية فليسوا كذلك وهم معذورون في اجتهادهم وإن أخطأوا الحق. ويجوز التعامل والتعاون معهم على البر والإحسان والتقوى، وهذا شيخ الإسلام ابن تيمية رحمه الله قد تتلمذ على كثير من العلماء الأشاعرة، بل قد قاتل تحت راية أمراء المماليك حكام ذلك الزمان وعامتهم أشاعرة، بل كان القائد المجاهد البطل نور الدين زنكي الشهيد، وكذا صلاح الدين الأيوبي من الأشاعرة كما نص عليه الذهبي في سير أعلام النبلاء، وغيرهما كثير من العلماء والقواد والمصلحين، بل إن كثيراً من علماء المسلمين وأئمتهم أشاعرة وماتريدية، كأمثال البيهقي والنووي وابن الصلاح والمزي وابن حجر العسقلاني والعراقي والسخاوي والزيلعي والسيوطي، بل جميع شراح البخاري هم أشاعرة وغيرهم كثير، ومع ذلك استفاد الناس من عملهم، وأقروا لهم بالفضل والإمامة في الدين، مع اعتقاد كونهم معذورين فيما اجتهدوا فيه وأخطأوا، والله يعفو عنهم ويغفر لهم. والخليفة المأمون كان جهمياً معتزلياً وكذلك المعتصم والواثق كانوا جهمية ضُلاَّلاً. ومع ذلك لم يفت أحد من أئمة الإسلام بعدم جواز الاقتداء بهم في الصلوات والقتال تحت رايتهم في الجهاد، فلم يفت أحد مثلاً بتحريم القتال مع المعتصم يوم عمورية، مع توافر الأئمة في ذلك الزمان كأمثال أحمد والبخاري ومسلم والترمذي وأبي داود وعلي بن المديني ويحيى بن معين وأضرابهم من كبار أئمة القرن الهجري الثالث. ولم نسمع أن أحداً منهم حرم التعامل مع أولئك القوم، أو منع الاقتداء بهم، أو القتال تحت رايتهم. فيجب أن نتأدب بأدب السلف مع المخالف. والله أعلم وصلى الله على محمد وعلى آله وصحبه وسلم. Answered by: A group of scholars and authors. Question: What is the ruling on working with the opponents to the creed of Salaf as-Salih, such as the Ash’aris and Maturidis and those who follow their way, and cooperating with them in matters of goodness and piety and general affairs? Is it forbidden to work with them no matter if the administration was in our conrol and they work under our auspices, or if it was under their control? Are they from seventy-two misguided sects, and is working with them considered from the realm of alligience with other than the belivers? Answer: All praise is for Allah, and may the Salah and Salam be upon the Messenger of Allah. 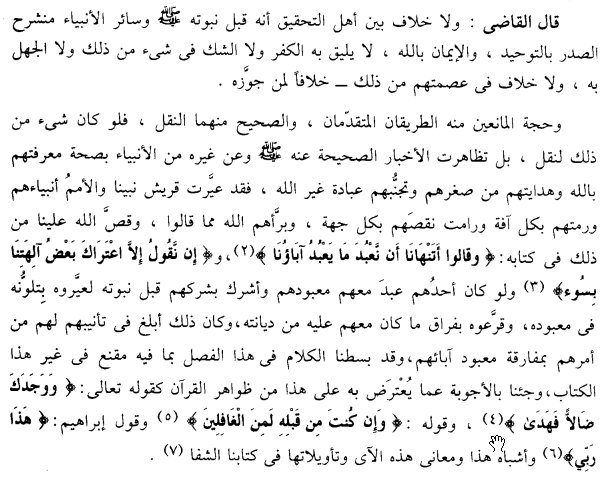 The Ash’aris and Maturidis have opposed what is correct when they performed Ta’wil of the Divine Attributes of Allah the Exalted, however, they are from Ahl us Sunnah wal Jama’ah and not from the seventy-two misguided sects except those who go into extremes among them in denial and agree with the Jahmiyah- where his ruling would then be like those of the Jahmiyah. As for the remainder of the Ash’aris and Maturidis, then they are not like that, and they are excused for their Ijtihad even if they erred in the truth. It is permissble to work and cooperate with them in piety, righteousness and goodness. Take Ibn Taymiyah, who studied under many of the scholars of the Ash’aris, nay, he even fought under the banner of the Mamlukes- the rulers of that time-and the generality of them were Ash’aris, nay, the military leader of that time, the brave Nuruddin al-Zanki the martyr as well as Salahuddin al-Ayubi were both Ash’aris, as has been stated by Imam adh-Dhahabi in his Siyar ‘Alam an-Nubala. And there were many besides them from the scholars, military leaders and people of rectification. 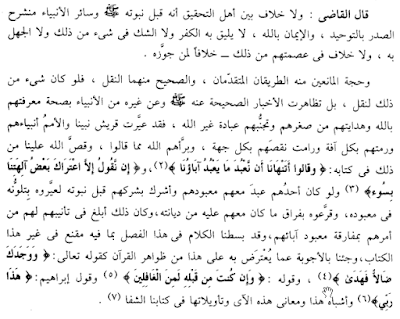 al-Bayhaqi, al-Nawawi, Ibn al-Salah, al-Mizzi, Ibn Hajr al-Asqalani, al-Iraqi, al-Sakhawi, al-Zayla’i, al-Suyuti, and indeed, all of the explainers of (Sahih) al-Bukhari were Ash’aris and many besides them. So with this, the people benefited from their knowledge and admitted their virtue and leadership in the Deen while believing them to be excused for what they made Ijtihad in and erred. May Allah forgive them and pardon them. 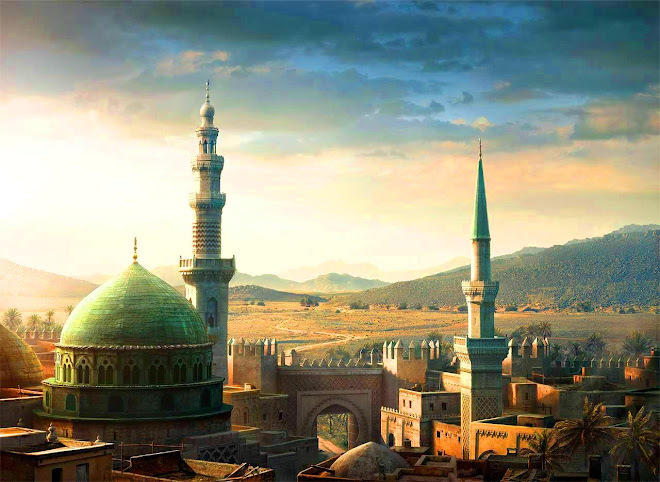 The Khalifah al-Ma’mun was a Jahmi Mu’tazili, as well as Mu’tasim and al-Wathiq, they were misguided Jahmis, however, none of the Imams of Islam delivered Islamic legal verdicts to the effect that it was not allowed to follow them in prayers and fighting under their banner in Jihad. So no one, for example, gave a legal verdict stating that it was not allowed to fight with al-Mu’tasim on the day of al-Amuriyah, despite the large numbers of Imams in those times such as: Ahmad, Bukhari, Muslim, Tirmidhi, Abu Dawud, Ali ibn al-Madini, Yahya ibn Ma’in and their likes from the major Imams in the third generation of the Hijrah. Tawhid is Simple Not Complicated!